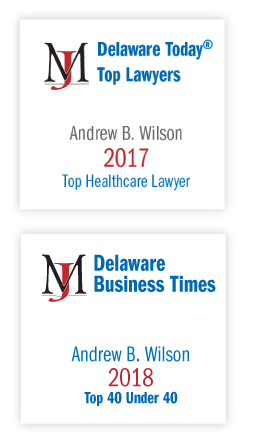 Andrew B. Wilson is an attorney and legislative specialist in Morris James' Health Care Industry and Government Relations Groups. Andrew works on a range of healthcare issues throughout the practice of medicine, assisting clinicians, practices, and other entities through licensing questions, regulatory compliance, and how to innovate using tools such as telehealth. Andrew understands that clients may encounter areas of the law where the system is either out of date or didn’t account for a client’s situation. He works with those clients to see if their barriers can be overcome through legislative and regulatory change. By working directly with key officials in the executive and legislative branches to implement policy changes – guided by his experience helping make the Medical Society of Delaware and its many physician members the second most legislatively-productive group in Delaware – clients can succeed in Delaware. After graduating with his Juris Doctor from Albany Law School in 2010 and before moving to Delaware, Andrew worked as Counsel and Policy Analyst to members of the New York State Senate. He produced legislation, committee reports, and staffed press conferences on a weekly basis, addressing time-sensitive public policy issues. He also served as Counsel to the Senate Committee on Alcoholism and Drug Abuse. Additionally, Andrew has developed extensive knowledge of political campaigns in Delaware, working in a range of roles from volunteer to statewide Campaign Manager. He trains candidates, incumbents, and staffers on best practices, compliance, and campaign finance. Senate Bill 227, AN ACT RELATING TO PRIMARY CARE SERVICES (Creating a payment floor to slow the collapse and consolidation of primary care services in Delaware and establishing the Primary Care Collaborative), signed into law August 29, 2018. HB 319, AN ACT RELATING TO EXPERIMENTAL TREATMENT HEALTH INSURANCE COVERAGE (First-in-the-nation legislation to create efficiencies to bring experimental treatments into mainstream care), signed into law June 13, 2018. HB 381, AN ACT RELATING TO PRE-AUTHORIZATION (Now-model legislation for lessening the burden of prior authorizations and requiring data transparency of the prior authorization process), signed into law July 2016. House Bill 69, AN ACT RELATING TO TELEMEDICINE SERVICES (Expanded telehealth delivery to health professions in Delaware and created insurance payment parity), signed into law July 7, 2015. House Bill 70, AN ACT RELATING TO MIDWIFERY (Created a new profession of licensed midwifery), signed into law June 9, 2015. Senate Bill 101, AN ACT RELATING TO NURSING (Modernized the code in relation to Advanced Practice Registered Nurses), signed into law September 3, 2015. Senate Joint Resolution 10, ESTABLISHING A JOINT EXECUTIVE AND LEGISLATIVE TASK FORCE TO STUDY AND MAKE FINDINGS AND RECOMMENDATIONS REGARDING A UNIFIED STRATEGY TO COMBAT LYME DISEASE, signed into law July 21, 2014. House Bill 88/House Bill 302, AN ACT RELATING TO POSSESSION OF DEADLY WEAPONS BY PERSONS PROHIBITED AND TO HEALTH AND SAFETY (Restricted gun ownership by persons with propensities for violence), defeated in Senate 2014 as HB 88, signed by Governor into law as HB 302 in April 2018. Senate Bill 116, AN ACT RELATING TO SEEKING HELP FOR AN ALCOHOL OR DRUG OVERDOSE OR OTHER LIFE THREATENING MEDICAL EMERGENCY (Created a safe harbor for reporting overdose victims), signed into law July 2, 2013. Primary Care in the Spotlight: Senate Bill 227,” Delaware Medical Journal, August 2018. Delaware, Our Region, Our Nation, and Patient Centered Medical Home, Medical Society, June 2013. The New York State “Card Hard Campaign”: New York State’s Efforts to Curb the Use of Fake IDs, New York State Senate, May 2012. Assessing the Effectiveness of Substance Abuse Treatment Under Rockefeller Drug Law Reform, New York State Senate, February 2012. Asthma Prevention and Management in Bronx, New York City and New York State at Large, New York State Senate, July 2011. Expansion of New York State’s Risk Assessment and Management Activities, New York State Senate, March 2011. Drew Wilson to Participate in a Delaware Bar CLE Panel Discussion Titled "America’s Opioid Epidemic and the Law"